충무공 이순신의 공훈을 기념하기 위하여 건립된 우리나라 최대 규모의 대첩비이다. 전라남도 해남의 해남 명량대첩비(보물 제503호)와 함께 일제의 박해로 1942년 서울로 운반되어 행방을 알 수 없다가, 광복 이후 해남지역 유지들의 수소문으로 경복궁 근정전 앞뜰 땅 속에서 찾아내어 지금의 자리에 다시 세워졌다. 비(碑)는 한 돌로 이루어진 바닥돌 위에 거북받침돌을 두고, 비몸을 세운 후 구름과 용, 연꽃 등이 조각된 머릿돌을 올린 모습이다. 비문의 글은 당시 이름을 날렸던 이항복이 짓고, 글씨는 명필 김현성이 썼으며, 비몸 윗면의 ‘통제이공수군대첩비(統制李公水軍大捷碑)’라는 비 명칭은 김상용의 글씨이다. 조선 광해군 7년(1615)에 세워졌으며, 비의 왼쪽에는 숙종 24년(1698) 남구만이 지은 비의 건립에 관한 기록이 남아 있다. 기록에는 이순신의 막료로 활약하였던 수군통제사 유형과 좌수영지역의 유지 및 후손들의 노력으로 건립하게 된 경위를 비롯하여, 이 때 여수 타루비(보물 제1288호)도 대첩비 옆으로 옮겨 세우고, 비각을 세워 보존하였다는 비 건립 전후의 기록이 밝혀져 있다. 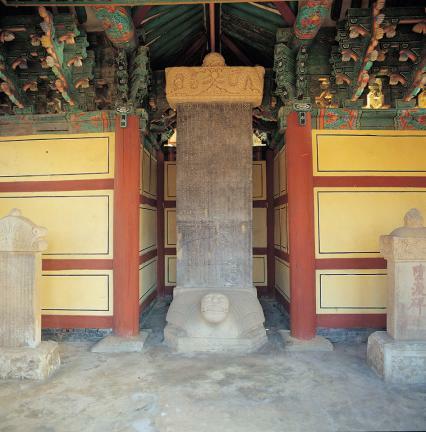 This monument commemorating the wartime accomplishments of Chungmugong Yi Sun-sin is the largest battle memorial that has survived from ancient times in Korea. In 1942, the monument was moved to Seoul by the Japanese colonial administration, along with the Monument for the Victory at Myeongnyang Battle (Treasure No. 503, Haenam, Jeollanam-do), as part of its policy of cultural oppression. 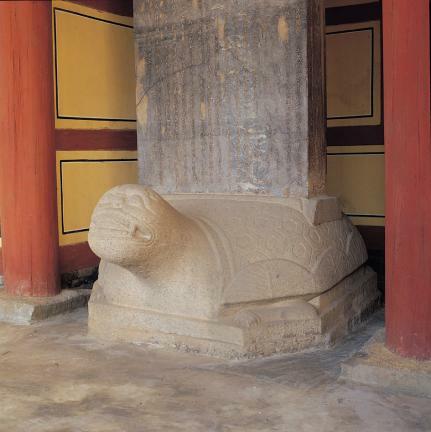 Since then, the whereabouts of this monument were unknown until after the Liberation, when it was located by a group of local dignitaries of Haenam and dug out from the ground outside Geunjeongjeon Hall in Gyeongbokgung Palace. 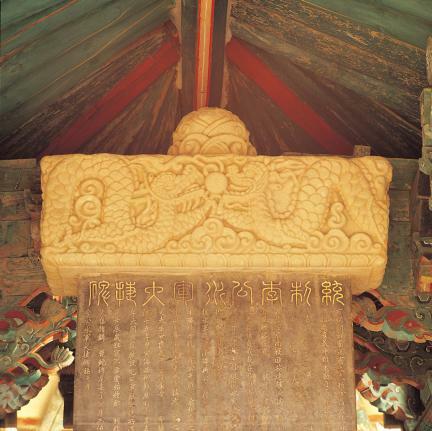 The monument is erected on a stone tortoise and a base below it, with the tortoise and the base carved out of a single stone block, and is surmounted by a head stone with bas-reliefs of cloud, dragon and lotus motifs. The text of the epigraph on the front was composed by Yi Hang-bok, and was written by the hand of Kim Hyeon-seong, both of them famous for penmanship and calligraphy, respectively, at the time of construction of this monument. At the top section, the title of the monument, which reads “Tongje Yigong Sugundaecheopbi”, was written by the hand of Kim Sang-yong. This victory memorial was erected in 1615 (the 7th year of King Gwanghaegun’s reign). On the left side of the monument, there is a monument with inscription describing the circumstance of its construction. 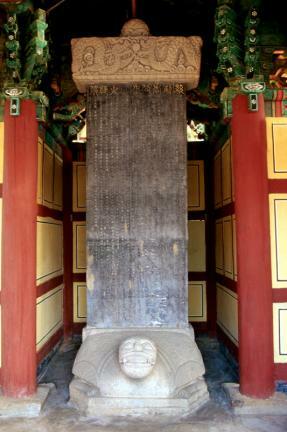 The text of this monument was authored by Nam Gu-man in 1698 (the 24th year of King Sukjong’s reign). It recounts how the Naval Commander Yu Hyeong, who fought alongside Yi Sun-sin, joined hands with the dignitaries of the towns near the naval base under the latter’s command, and his descendants, to build the memorial. It also says that the Tarubi Monument, Yeosu (Treasure No. 1288) was moved here and placed next to this memorial at the time of its construction, and that a pavilion was built to shelter the monuments.